WUKO & AD Philippine Delegation Inc. It all started in 1970, when Mr. Sasakawa, a Japanese multimillionaire, and Jacques Delcourt, the French president of karate, decided to establish the first world karate organization. Ryoichi Sasakawa can be considered the true father of karate in the world. It is mainly due to his support that this discipline, from the 1970’s until today, has boomed. In 1990 the WUKO&AD should have merged with the Itkf, traditional karate organization, to obtain the recognition of the IOC ( International Olympic Committee). For various reasons the merger didn’t take place and the IOC recognized only the Wuko, provided that the name was abandoned. This was the case and from the ashes of the WUKO&AD originated the WKF ( World Karate Federation ), the unique world organization recognized by the IOC which, under the leadership of the Spanish president Espinos, is still fighting for the Olympic recognition of karate. This goal could be achieved in 2016. In April 2005 Carlo Henke, 8 dan master, having checked up on the availability of the name “Wuko”, which had been abandoned for fifteen years, decided to re-establish the organization changing its logo: both were regularly registered in the whole world. In July 2005, in Fortaleza, Brazil, Carlo Henke and a group of friends founded a world sports association named “Wuko” aimed at the development of karate on a sports and on a promotional level. Carlo Henke renounced the office unanimously proposed by the Congress and was appointed Honorary President and warrantor of the rules for all members. The association grew quickly, not least because the aims were and are different from the ones of the WKF, which aspires at the Olympic Games and recognize only one organization per nation. The new WUKO&AD recognizes every federation submitting a membership request: a significant success, which however caused an imbalance in the order of bureaucracy and organization. The managerial group, strong as far as organization is concerned, showed grave imbalances from the bureaucratic and statutory point of view, forcing the Honorary President to revoke the temporary concession of the WUKO&AD name and logo. The conditions of a correct restoration of the statutory rules to obtain again the use of the name and logo weren’t accepted by the managerial group and Carlo Henke was forced to found a new sports association to which he could give the prestigious trademark. On the 14th of November in Verbania (Italy) the sports, no-profit association named WUKO ( World Union of karate-do Organizations ) was founded and the new Statutes were approved. A new adventure is about to start, this time under the leadership of Carlo Henke as Chairman. The Directing Committee made up of six vice presidents was elected at the end of 2009, during the first World Championship, together with the Technical and Refereeing Commissions. For all the devotees of karate, who put the moral values of this discipline above the rules of an external business, this is a unique opportunity to participate in the history of the true karate, beyond any personal profit. In 2008 the Directing Committee decided to change name into World United Karate Organization and in 2014 into WUKO&AD ( World United Karate Organization and Associated Disciplines). 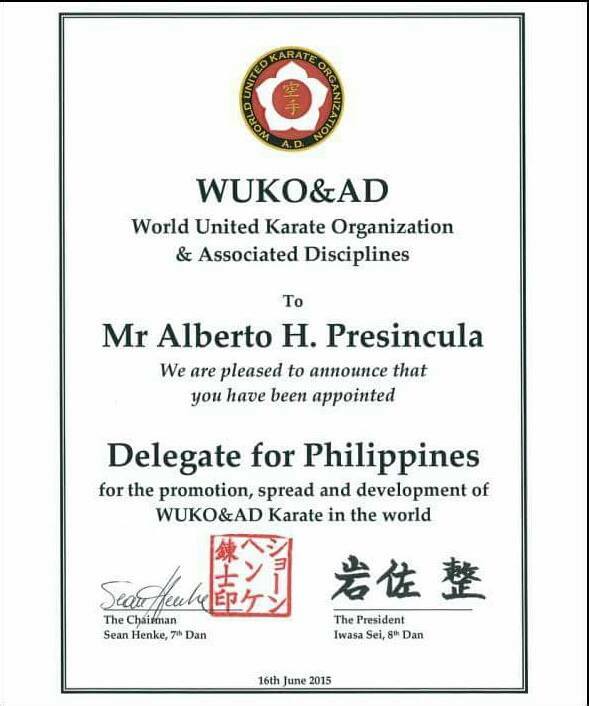 On May 20th of 2015, Kyoshi Alberto Presincula became a member of WUKO & AD. 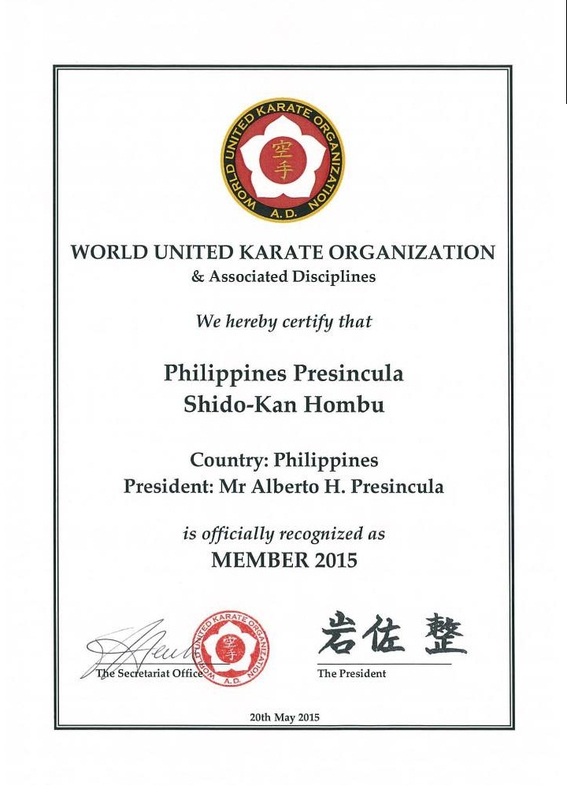 June 16, 2015 WUKO & AD awarded Kyoshi Alberto Presincula as an official Philippine delegate of the said organization. Thank you kyoshi for your none stop dedication in shido-kan family, Ossu!! !